I am still thinking that Spot the beast 41 was too difficult! To make up for this, I am presenting you with this (more dangerous) creature we found while walking in Carmelo, Uruguay. It is a venomous snake known locally as “yara”, “yarará” o crucera (crossed pit viper)(Bothrops alternatus). It is found in Brazil, Paraguay, Uruguay and Argentina and, although not naturally aggressive, it is an important cause of snakebite. The reason for this is its reliance on its comouflage for protection. It is then easy to either step on it or nearby causing a defensive reaction that can end in a bite. The venom is haemolytic and can cause serious tissue damage although is not as deadly as it is generally believed. 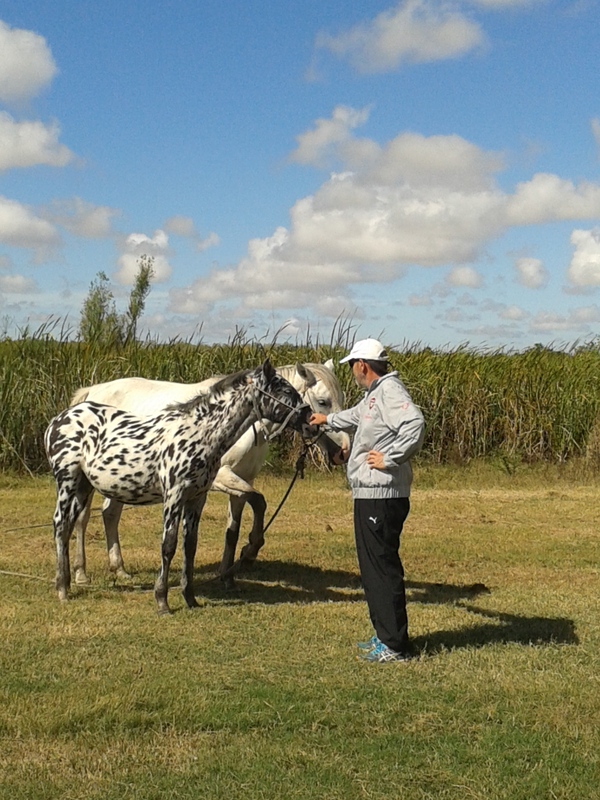 In November 2014 I shared with you the finding of a “River Plate zebra” youngster. Although I walked almost daily -when in Carmelo, Uruguay- through that area, I did not see it again so I had almost forgotten it. That is why I was pleasantly surprised when this week, almost two years later, I saw a similar animal, now almost an adult and still “approachable”. At first sight I was convinced that it was the same horse. However, comparing today’s pictures with those above (from 2014) I had some doubts as the coloration had somehow changed. Although I would be surprised that another animal such as this could exist in my town, I consulted some “experts” with who I share beach afternoons and I was assured that changes in colour do take place when the animal grows. I did not dare to get close and ask her if she was the same I saw in 2014. I was fearing “horse bite” and -much more importantly- possible rude comments from some readers, particularly those from “down under”. So, I only managed to take new pictures of her from a prudent distance and speculate on its real identity. Growing up has somehow changed her but it is still an eye-catching animal! That there are horses in South America should not be a surprise to anyone. These beasts were introduced by the Spaniards in the 1600’s and they have been adjusting to their new environment and multiplying ever since while becoming invaluable in many agriculture-related tasks. The bushsnob pointing towards Carmelo at the origin of the River Plate in Punta Gorda. Carmelo is located in the South-West of Uruguay, just downriver from the joining of the rivers Paraná and Uruguay, the start of the river Plate, “discovered” in the 1500’s. This is the place I was born and I am a proud member of this small town, full of character and characters. Carmelo is the only city in Uruguay founded by our national hero: José Artigas, a man far too advanced for his time. It is here that a well-known barber, after having won the small local lottery, closed the shop and went home to rest. Before leaving, he placed a sign on the door that read: “CLOSED DUE TO EXCESS OF CASH”. Carmelo was two hundred years old on 12 February 2016 and I happened to be there to enjoy the celebrations. I was an adolescent fifty years ago when its one hundred and fifty years were commemorated and I still keep some memories from that time. I recall that we had an excellent home delivery system for many services, mainly food items but other services as well. The fishermen (no fisherwomen then) would carry their catch hanging from stick tripods and shout “Pescadooooor!” while walking through the many streets of the town, selling their catch to the housewives that would wait for the calls to come out of their houses and argue the price for, usually, half a fish. There were also knife sharpeners, pot welders and kerosene-stove fixers doing their rounds either on foot or on bicycles. There were also lots of horse carts. They came in various models: open or closed, with rubber or wooden wheels each delivering their goods: fruits and vegetables, meat, bread, firewood and milk. In particular I recall the time my mother got extremely upset when she found a small fish in the milk that was rather enthusiastically watered down from a small stream by the milkman! There were also carts to collect your refuse and those unwanted objects from your home. A precursor of today’s carts at the 200 years’ parade. A 3-HP precursor on parade. Fifty years have passed and the horse carts are still here, together with the odd knife sharpener still playing its tuneful whistle up and down the musical scale to announce its arrival! They all contribute to build Uruguay’s reputation as the greenest country in South America. In light of the above, I was not surprised when I read an article found by my wife describing the vegetable sellers of Baltimore in the USA. Although they look more “upmarket” ours also have a few notable features worth mentioning! Today, horse carts (from one to three horse power!) ride through the streets of Carmelo offering a variety of home-delivery services. Over the years they have incorporated notable improvements: better brakes and more asphalt-friendly rubber wheels, the accompanying dogs are better trained: they now trot under the carts rather than after them! Other notable advance is the displaying on the carts of cellular phone and even e-mail addresses where they can be called! A 1-HP model used for bread delivery. A more rugged 2-HP version. Apart from those selling fruits and vegetables and the bakers, there are also others that can bring you firewood or building materials as well as removing unwanted items from your home such as rubble and rubbish. There is even a category that I would call “Man With a Cart”, able to perform tailor-made tasks for the customer. The tool of the “Man With a Cart” Note the cellphone No. on the horse’s harness! One, belonging to someone that went to primary school with me, is usually parked a few paces away from home waiting for customers. I spent some time watching it. The first thing I noted was that the horse was in good nick and “parked” unrestrained! It carried orange traffic cones to demarcate its working space as well as a spade and a luggage-carrier on one side and gardening tools on the other. In addition it had its own feed bucket for the horse and canvas and tying ropes to secure its potential cargo. Additional tools carried by the cart. A relaxed horse waits for a job. It seems that, although the Baltimore horse and buggy fruit sellers seem to be gradually going out of business, those in Carmelo are only adapting to the changing times and they will probably still be here in fifty years time. While I can easily see drones taking over the fruit delivery in Baltimore (and the rest of the USA!) I predict that Amazon will sub-contract their goods delivery to our greener -if slower- horse powered Man with a Cart if it wishes to keep its act “green” in Uruguay. Yes, I know I have not written much of late. Several reasons explain this. We are busy moving from Argentina to Uruguay and viceversa, social life pressure and, most importantly, my Editor is very busy at the EXPO in Milan. Rumors that I had finally packed up brain-wise to a severe case of dandruff are totally an utterly false as this disease does not affect your brain! Besides, I became immune to it when I lost my hair! So now to serious (or less silly) issues. 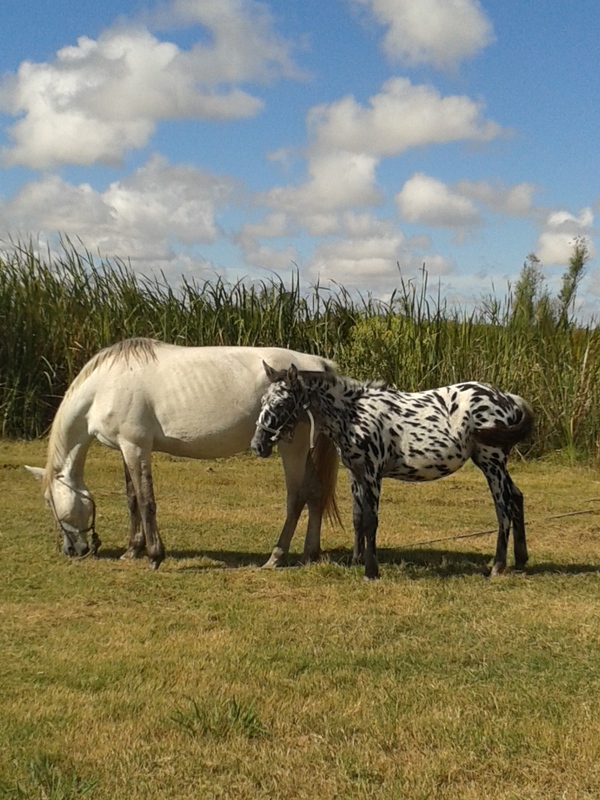 You will recall that a few months back I reported on a zebra-like filly I found while walking in Carmelo? I am pleased to report that it is growing well and our “relationship” continues improving (I managed to scratch her nose the other day!). She has grown a bit now and I am sure will do well. 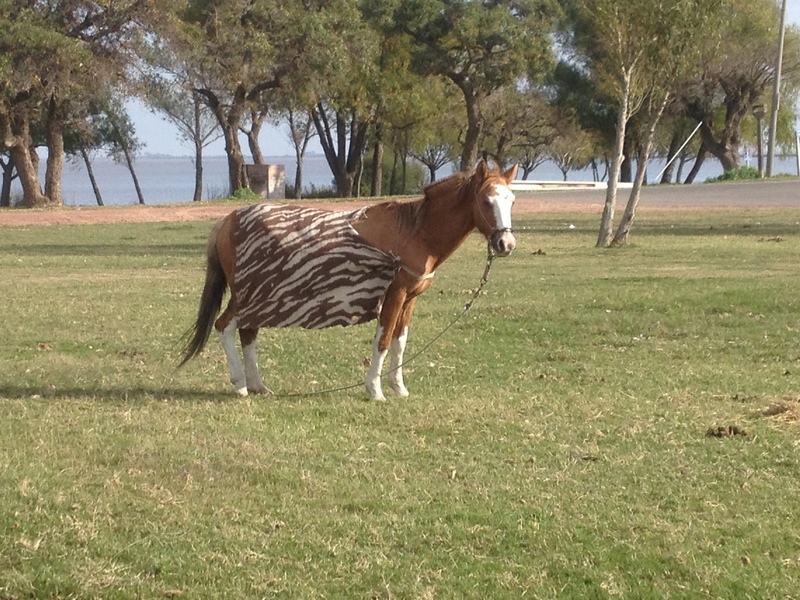 A grown version of the zebra-like horse photographed a couple of weeks back. The Bushsnob improving his relationship with the beast. Walking this morning I came across a few horses in the distance. As usual I looked for our filly and identified it among others. I got closer to salute it and then, to my utter shock, I saw a real zebra among the horses! “This cannot be!” was my first thought while I kept walking towards the equines. It was and below is the proof! 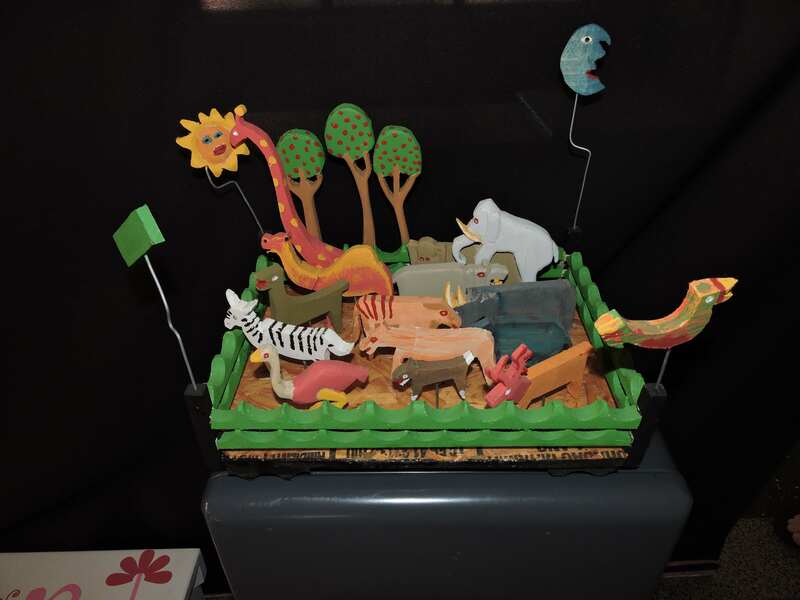 This animal “salad” was made with wood pieces. Included because my blog is on wildlife! 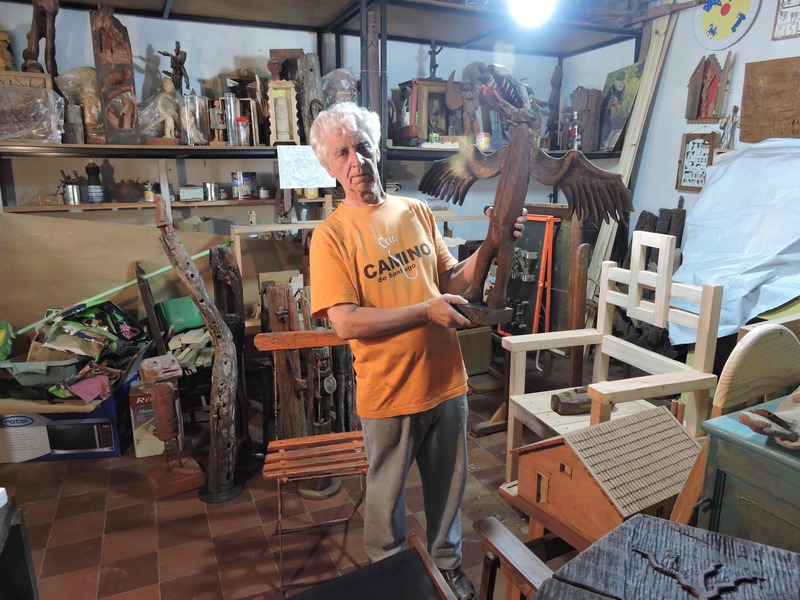 The shop -that also sells house ware and ornaments- belongs to José (Pepe) and Rosa Castro. The latter takes care of it and deals with customers. They have a teenager son called Alexandro. After a few visits I met Pepe and we gradually got to know each other. He was -rather unusually- interested in my life in Africa and I listened to what he did. We lied to each other a lot and we knew it! One day Pepe convinced me to linger a few minutes so he could show me his work. I luckily accepted and I was privileged to gain a glimpse of his life’s achievement. I am aware that by writing this post I am completely deviating from the usual wildlife-related topics and that I am entering a territory I know little about. I hope you find this interesting. In any case, I promise you that my next post will be on the usual nature-related subject (what else?). As a veterinarian and a scientist the understanding of art is not my thing and not even several years in Rome managed to change this too much. For this reason I like what I like but I can also appreciate the work that goes into creating works of art! In Pepe’s case, despite being “brain-impaired” when it comes to art, I not only like a lot of what he did (and does) but also appreciate the work involved in achieving it! What can I say? Its title is “Climbing”. 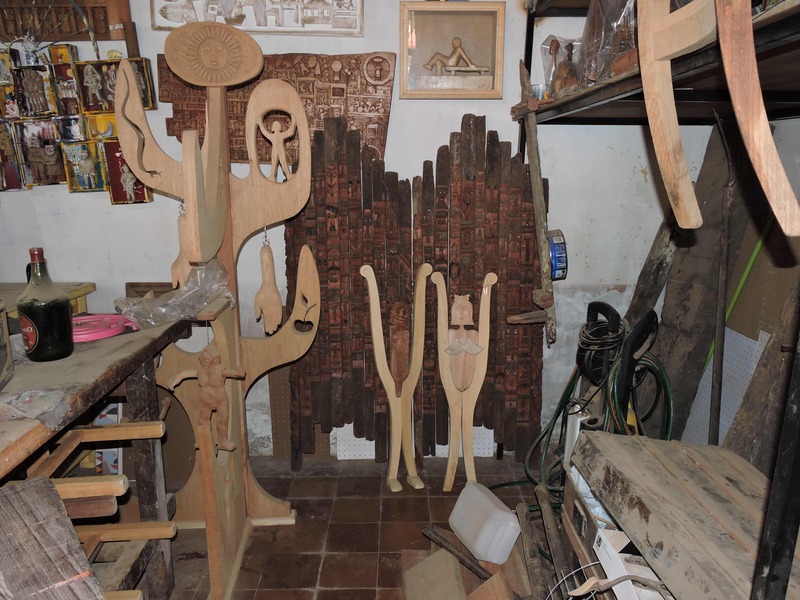 I learnt that, so far, Pepe has created over eight hundred pieces (carvings, artistic chairs, wood panels, boxes and other items) and I could see several styles although I am unable to comment or seriously criticize them! HIs creativity outruns storage space! 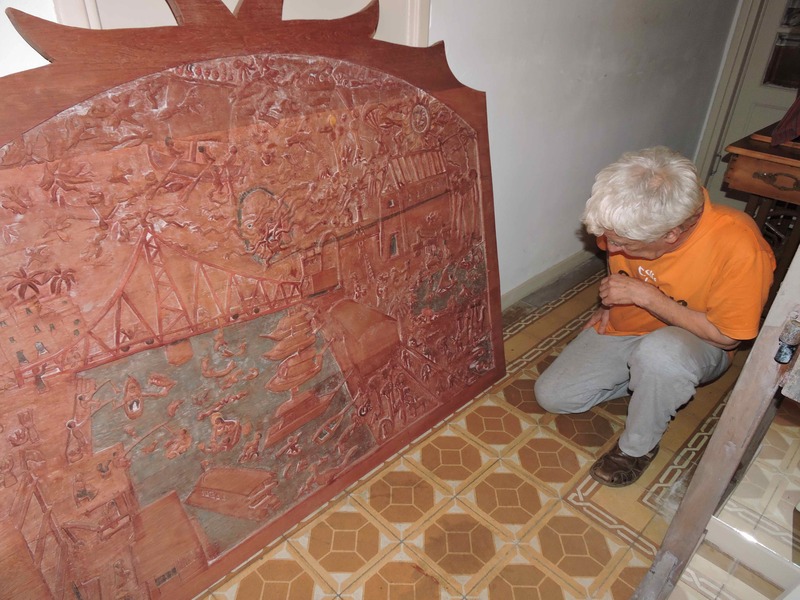 Fortunately, as he got to know me, he started to show me his work and to explain it to me. To be able to look at art with the creator showing it to you is out of this world and I felt -aware of the possible differences- like a friend of Picasso being able to question him about details of his masterpieces! Pepe explaining a work about Carmelo. 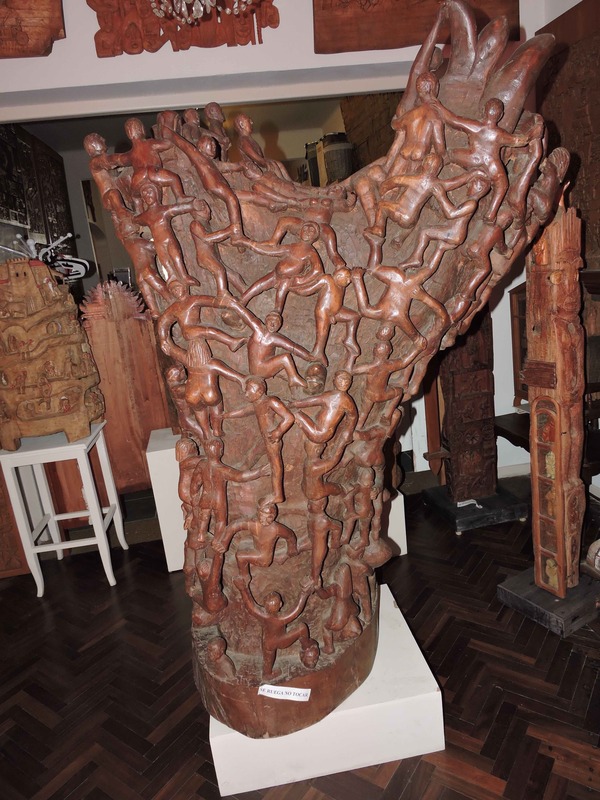 Pepe has exhibited his work several times, he has been the subject of interviews and published accounts of his work also exist. Leafing through these I learnt that his style of work is defined as “Baroque” and that many of them deal with his life experiences and/or tell a story. Some of his works are so elaborate and full of detail that it takes several examinations to fully take in their meaning and detail. 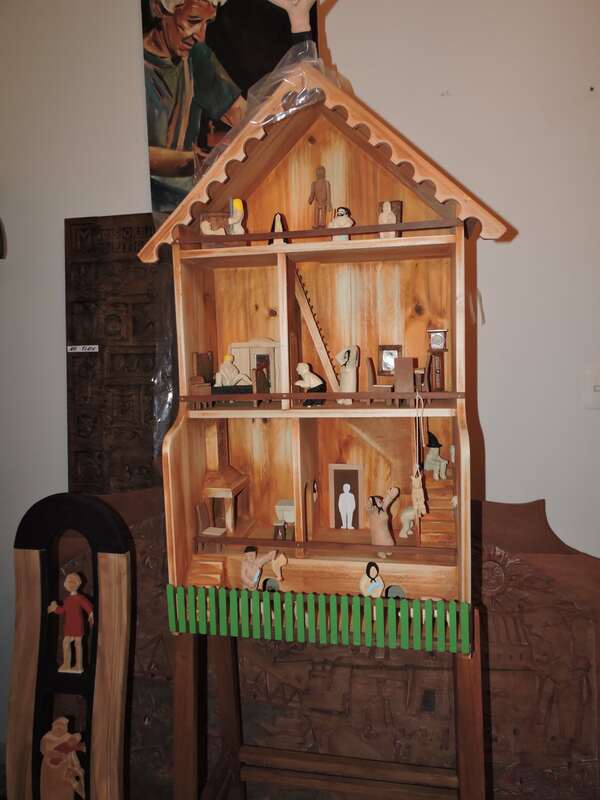 Several pieces represent episodes of Pepe’s life. This is a “haunted” house he secretly visited as a child. Since meeting him I have now talked to Pepe a great deal and also watched him working. Although he appears lighthearted and funny most of the time, when it comes to his work he transforms himself into a different man, guided by his inspiration and aims for almost impossible perfection! However, he transmits his mischievous view of life into his work that often has a jocose element in it that can become satiric in several of his works (keep reading!). A great chair is not enough for Pepe. One day he called me, as he had to show me “something”. 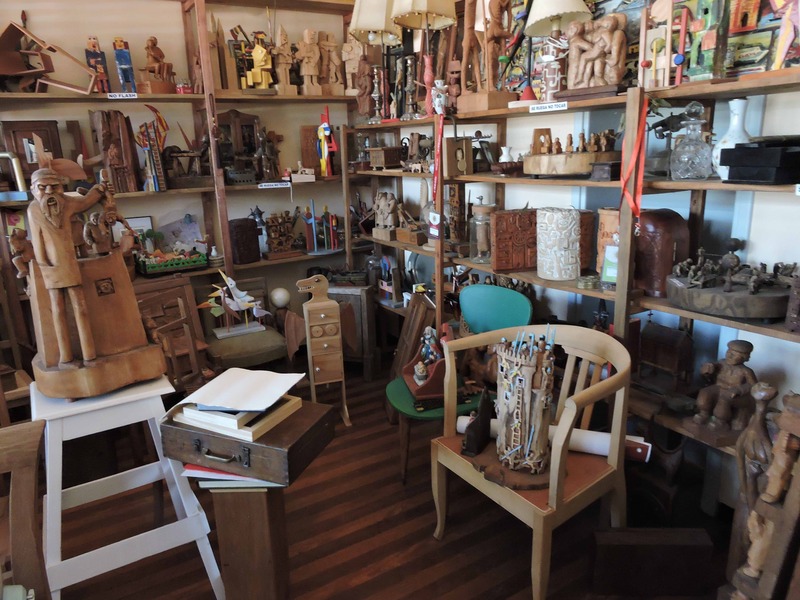 He took me to his workshop and, seeing it for the first time, I was really impressed. 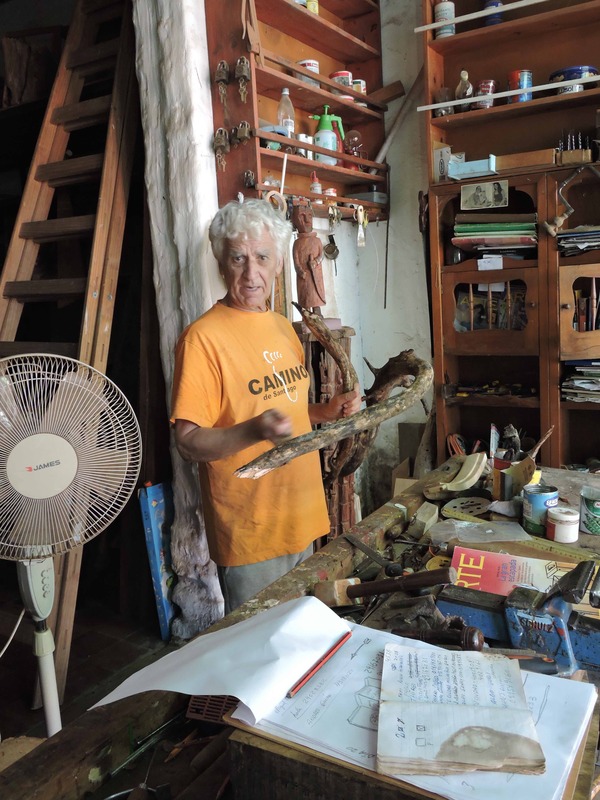 It is inside his “Cave” as he calls his workshop, that Pepe becomes the artist. “It is here that I feel really comfortable, it gives me pleasure, I have fun, I play”. This is his secret kingdom and where his ideas get transformed into art. 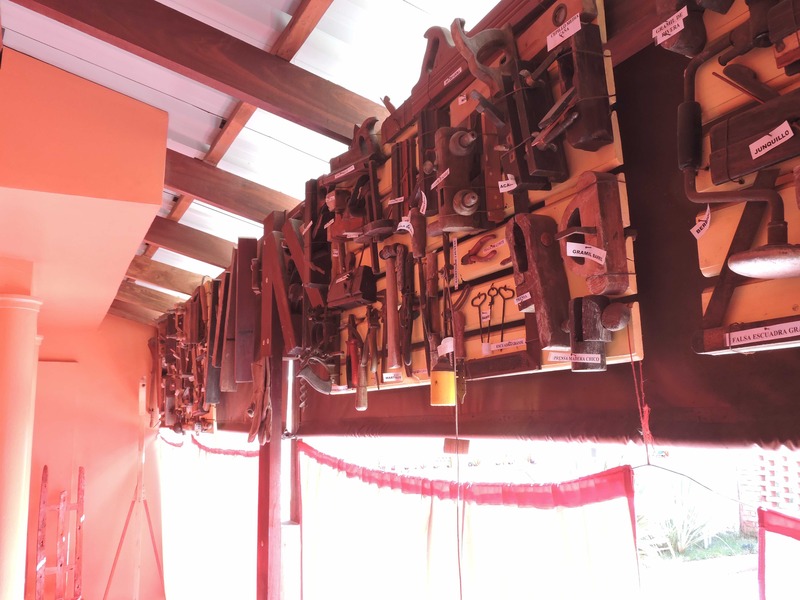 It is also here that he keeps a vast collection of carpentry tools that are his pride and joy and are worth seeing. Once inside the Cave I noticed many pieces of wood and roots of several types, origins and shapes that are patiently waiting until Pepe decides to gives them the life or death he “sees” for them. In some, the final output is starting to emerge as Pepe works his way through them. 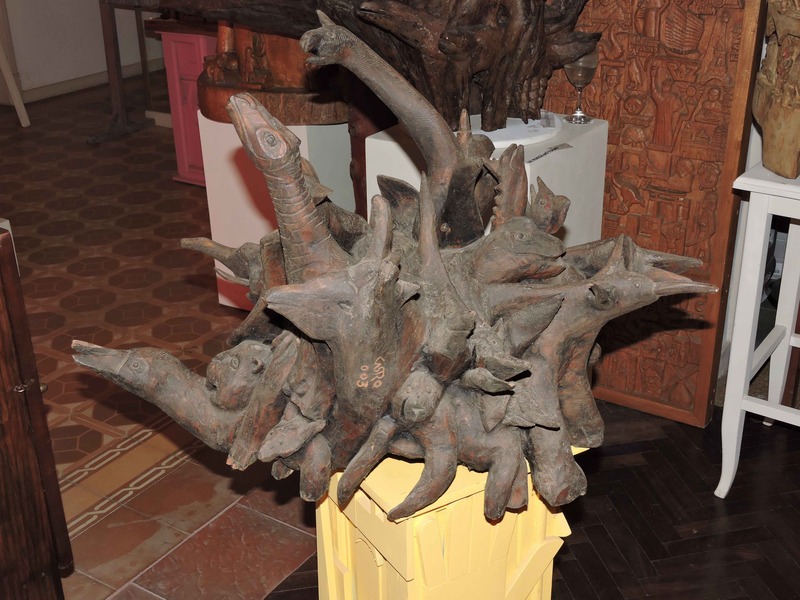 I spotted a large tree trunk base with its roots still attached, to which he has wrapped carved branches and sticks of different colours. Questioned about it he said “I am looking at it and considering several options. I do not know yet. I have about ten ideas. The one on the surface at the moment is to place dwarfs peering through its holes. I do not know yet but it will be something creepy”. Then he picked up another piece and starts to showed it to me. “Look” he said, “there is a tail here and a leg there” and suddenly, but only for a fleeting moment, I began to see what he saw. And then he said, “it is not a normal animal, it is some kind of a creature” and then he loost me again as I stayed with the tail and the leg and my conventional animal! Only then I managed to recognize the burnt and dirty dried fig tree we collected together! A simple dried and half-burnt root (collected together) starts to gain shape. 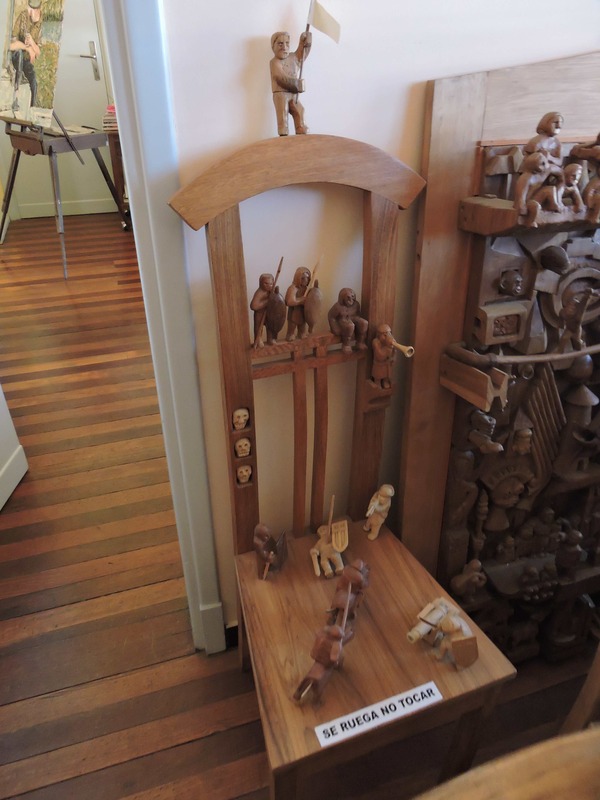 When I told him, he laughed and moved on to show me the twelve “special” dining chairs he is making or his on-going depiction of the execution of another creature in the electric chair. “The victim will not be normal, it will be a being or something but I do not yet know” he said, and then added “it will be tied to the chair”. Pepe showing me another piece. The electric chair project to his left. We walked through his house where his finished work is displayed. 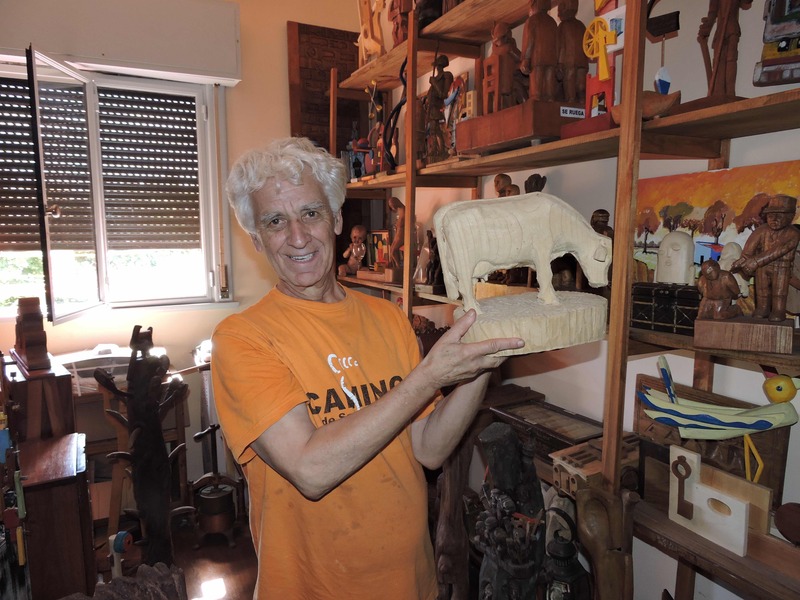 He said, “When the conditions are right, I would like to start a Foundation where not only I can display my work but also teach the young generations”. I can only silently hope that he succeeds and promise myself to help him in achieving his dream. Watching his finished works I can see that -like other artists- he can do what I consider to be “conventional” and beautiful sculptures as well as wonderful chairs that he decorates with his own unique creations of many shapes and forms. As he knows my animal preferences and he picked a simple cow from a shelf to explain that he left it partly undone so that people could see it in different ways. It is however clear that he put great detail into it as, for instance, the milk vein is clearly there! Some of his work I can understand (and admire) straight away (although more careful observation reveals more detail). 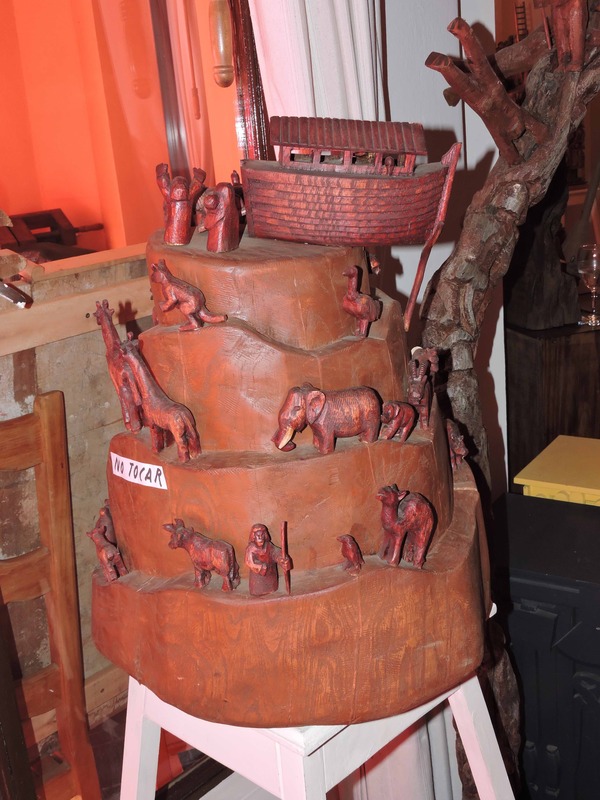 Among these is the “Babel Tower” and “Noah’s Ark”. Even the clear animal suffering that “Extinction” depicts is evident to me as its subjects really reflect the agony of their fate! Other work passes over my head and it is only after Pepe’s patient explanations and comments that I start seeing things and interpreting what he means. 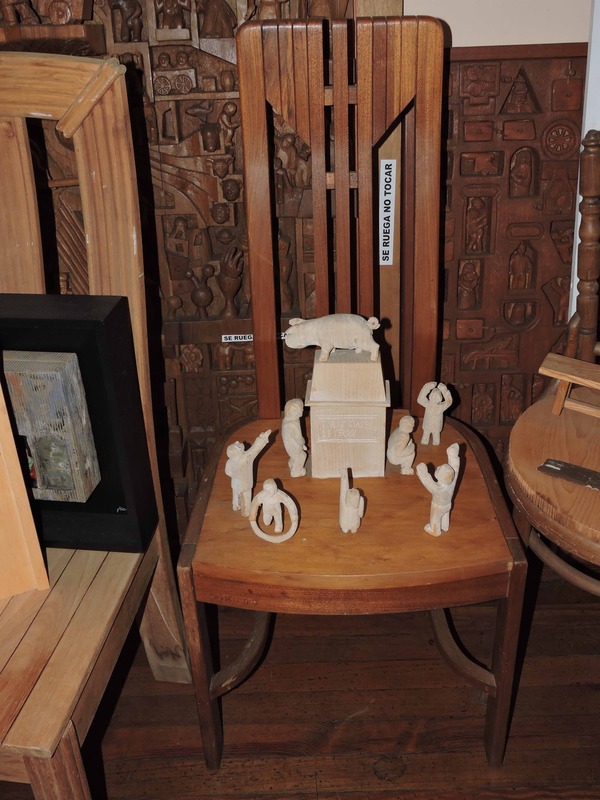 I see several styles, elaborate carvings, combinations of wood and paint -my favourites- and others. Clearly “Climbing” at its near two metres tall is one of his greatest achievements but there are others that although smaller are no less magnificent: wooden boxes that fit into each other like Russian dolls, colourful wooden “cubistic” jigsaw puzzles made of wood trimmings, old silk thread cabinets filled with carved world famous figures many of whom you can easily recognize as you do with the five Uruguayan politicians that he wickedly calls “Four Politicians”! 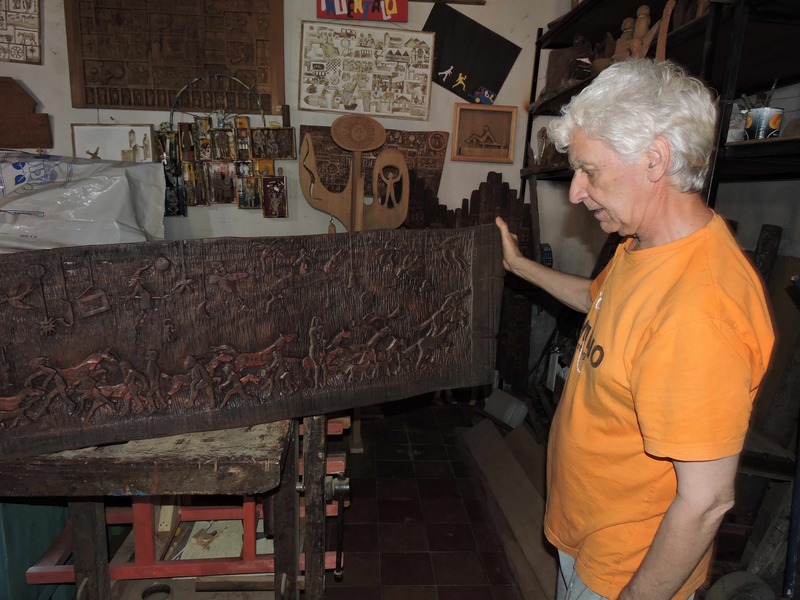 Some works follows the options that a piece of wood offers, but in others the wood follows what Pepe wants to get out of it. I think this simply depends on the mood and will power he has on the day he chooses to work them! We talked so much and I became so engrossed in his work that I got back home brain dead but happy to have spent time with him and to have a few -rather poor- pictures to illustrate the post. However, I also notice that I never saw what he wanted to show me in the first place! I decided to visit him the next day. So the following day I returned and he showed me the piece. 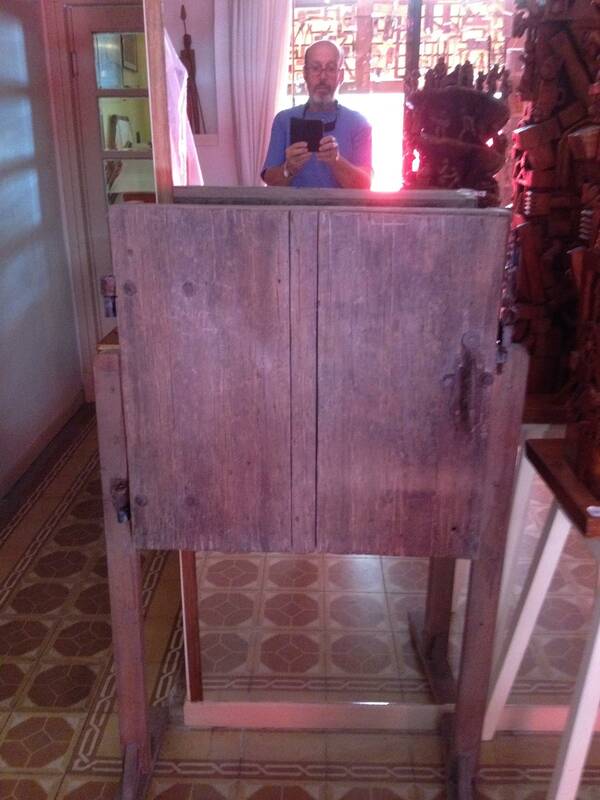 It is a wooden cabinet and when he starts opening it his wicked side takes over and, before I see it, I understand. 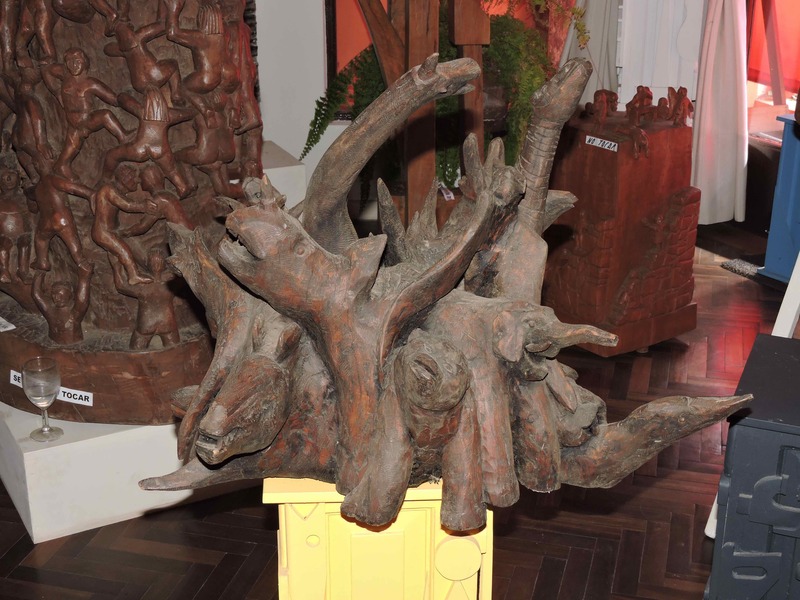 I am in it, together with him and a crocodile inside a cauldron and surrounded by animals and African people. 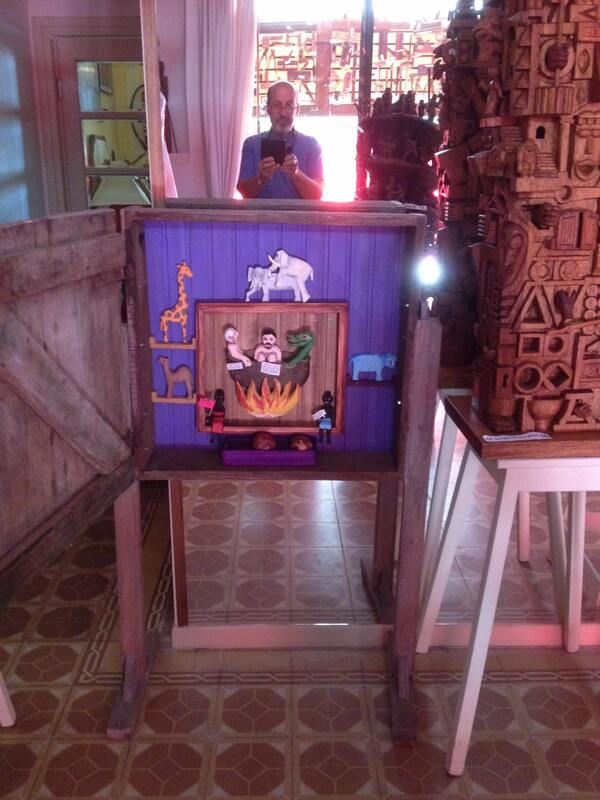 Somehow all my pestering of Pepe about Africa has curdled into art, even if clearly tongue in cheek. I am proud of being part of his work, although shown in rather uncomfortable circumstances… However, I now join the ranks of Don Quijote, Jesus, God and the Devil among others depicted in his works!